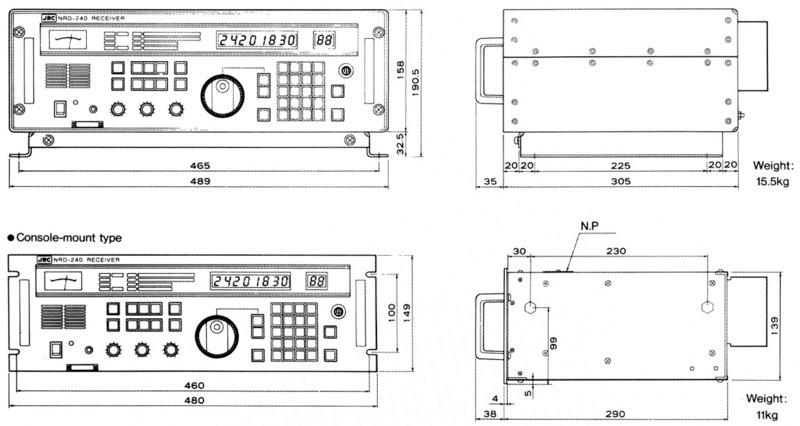 The Japan Radio Company NRD-240 was designed in compliance with the GMDSS carriage requirements under SOLAS. Coverage is 90.000 to 29999.999 kHz with 1 Hz display in LSB, USB, AM, CW, and FSK (RTTY) modes. The 2182 kHz emergency channel is immediately accessible. Supplied bandwidths include: 6, 3, 1 and 0.3 kHz. The built in 100 channel memory stores: frequency, mode, bandwidth, attenuator and AGC parameters. Scan and sweep are supported. Other refinements include: AF Filter, NB, Lock, Keypad entry, built in speaker, Squelch, BITE, Dimmer and AGC selection. The NRD-240 is designed for mounting in a standard 19 inch commercial rack. It is shown above in its optional MPBX10832 desktop cabinet. Copyright 2005-2016, Universal Radio, Inc.